I came across this little poem the other day. I wrote it back when I was in Bible college. Don’t worry, I don’t plan on quitting my day job. The dark, dank demons of valleys unwind. The back-lit shadow of future sublime. Ne’er shall I thirst or want for more. I’m a librarian. Currently I work at the reference desk, but in the past I’ve worked at the circulation desk (where the books come back in and get checked out). Nothing – well, almost nothing – gets me more steamed than when a book is returned with scads of fresh marginal notes and underlining. I dislike the practice so much, that I’m hesitant to mark in my own books – for fear that I’ll one day donate the book to a library and make another librarian hot-under-the-collar because of my marginalia. Now there’s a way to write in borrowed books (or even your own) without ticking off librarians! ** The “unclutterer” recently posted about 3M’s Sheer Color Post-it Notes. These notes are transparent, allowing the reader to lay down the protective note on a page of text and “mark up” the note instead of the book. Genius! Of course if the book is really good, and you want to use one of these stickies on each page, you will end up with a very fat book (with a skinny binding). This leads me to another pet peeve. At the end of the semester, we get loads of book returns. There’s bound to be several books in the pile that has Post-its hanging off of every other page with the last patron’s annotations. What a pain to remove them! (It’s not as big a pain as erasing pencil marks or lamenting pen/marker marks, but still a pain!) 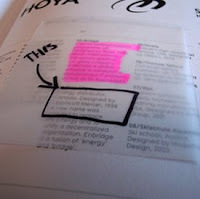 So, if you do start using these Sheer Post-its on library books, make sure you remove them first. On the way home from work today, I was listening to NPR’s “All Things Considered.” In one piece they noted biblical allusions strewn throughout Huckabee’s speeches. Certainly references to biblical allusions are in no way “new” to the political scene. From Lincoln to MLK to Obama the Bible has been a seedbed of imagery to suit political agendas. The NPR slot noted, however, that Huckabee’s allusions were being lost on biblically illiterate ears. For instance, Huckabee stated in one address, “Sometimes, one small smooth stone is even more effective than a whole lot of armor.” This is a rather easy allusion to pick out for the few folks who may happen to read this blog. Clearly Huckabee is speaking in a code that his conservative Evangelical supporters can decipher without too much trouble. NPR interviewed several folks in DC about these statements and most did not have a clue as to what a “widow’s mite” was or the significance of “loaves and fishes.” Many of these folks were born into Christian homes and attended Sunday school, but they still could not recognize Huckabee’s allusions. I even had to think a little bit harder than usual to completely take in the allusion to the little boy named David. So, while Huckabee may be speaking in the “Bible code”, many folks – even those who have had a “Christian” upbringing are hearing gibberish. Is Huckabee intentionally alluding to Scripture? Or is he simply speaking the language of a Baptist minister- turned-public-servant without intentionally trying to send encoded messages to his Christian constituency? This got me to thinking about the debates concerning the New Testament’s use of the Old Testament, particularly the detection of allusions and echoes to Jewish Scripture. Why would Paul put allusions to Scripture in texts that were primarily written for a Gentile, and (some assume) “biblically illiterate” audience? Did Paul simply speak the language of a learned Jewish Christian? Did he always intentionally encode his message with the intent of the audience knowing what he was talking about? Is it possible that Paul meant his allusions to “shout out” to those who could understand, while leaving others confused in a fashion similar to Jesus’ parables? How intentional was Paul? Are biblical allusions only meaningful from the standpoint of the author’s (or speech writer’s) intent? Or, do allusions and echoes take on a valid meaningful life of their own in the mind of the audience? Another thing struck me regarding this NPR piece. Ultimately, when Huckabee uses these veiled references to Scripture in a country where only a relative few “know the code”, he is in effect speaking gibberish. Preachers and teachers beware! We need not confound people with allusions they don’t understand – we don’t want their “biblical illiteracy” to get in the way of them hearing the Gospel. Of course, we are to teach people the content of Scripture – for their souls’ sake – but until they “learn the language” we just sound like the builders of Babel. Read the NPR print version of the segment “Understanding the Gospel According to Huckabee,” by Barbara Bradley Hagerty. My blog has been at a standstill for several weeks now. My computer crashed — thankfully after I got my final copy of my thesis submitted for binding. The crash provided a good excuse to reformat my hard drive. Now that a good friend has resurrected the beast, I think I’ll start putting it to use. I just hope that there is not too much data-loss. On top of computer woes, I’ve been downright exhausted and a bit bewildered. This is the first Summer in twenty-seven years, where I am not looking forward to the “next school year.” It’s a strange feeling — a mix of euphoria and vertigo that comes from no longer being identified as a “student.” While I have no intention of leaving academia (I’m still a reference librarian, and I have plenty of education yet to go), this change in identity is rather disconcerting. Nevertheless, I’m happy to have some time off, and I hope to put the Summer to good use. I’m off to a good start, as I’ve finally finished reading through the first six volumes of Harry Potter. It’s nice to think about less weighty things, like whether Dumbledore is really dead, or if Snape will turn out to be a good guy after all. I’m waiting with baited breath for The Deathly Hallows. I’m going to pick up Tolkien’s Children of Húrin next. I hope to pick up some academic reading as well. I was given a copy of The Messiah in the Old and New Testaments (ed. S. E. Porter), and it looks like a great read. I’ve also checked out the library’s copy of Reading James with New Eyes, a collection of articles on the Epistle of James, edited by J. Kloppenborg and R. Webb. Perhaps I’ll get a chance to abstract the articles and interact with them here. So, there are the plans. It’s good to be back in biblioblogdom. This afternoon I turned in my thesis to my readers. I don’t know when the defense will be, but for now there’s a bit of relief. Now I get to return to blogdom! Sean du Toit of Primal Subversion has posted about the commonly held view that the Epistle of James is the product of a two stage editing process. Generally the first stage was that James or the original author/orator produced sermons and the second stage editor arranged it into the work we have now. I’m not too well studied in this particular aspect of James, as I’ve pretty much assumed James the Just to be the author. Author AdministratorPosted on February 7, 2007 Categories UncategorizedLeave a comment on 2 Stages of James? This new blog will still feature resources on James the Just and the Epistle of James, but it will broaden in scope a bit. In general, I intend for “Old in the New” to refer not just to the use of earlier Scripture in the New Testament, but also to the use of various “old texts” in new ways – new technology, new studies etc. I am interested in the use of Scripture in Early Judaism and Christianity, but I am also interested in using software, blogs and computers in general to study Scripture. “Old in the New” will be my catch-all blog for what interests me, but I will continue to focus on biblical studies and particularly James the Just and the Epistle of James. So, if you have me bookmarked at the old address, you may want to change it to the new one . . . that is the “Old in the New” one. I will actually migrate to the new address on New Year’s Day.